Former Scotland Yard Commissioner Lord Stevens stands to profit from a deal worth an estimated £4million with a British university to train more than 100 Libyan police officers in the UK. The controversial arrangement to provide forensic science training at the University of Huddersfield has enraged Libyan human rights activists living in the UK. The university has been given technical help from Axiom International, a security and forensic science company chaired by its major shareholder, Lord Stevens. The Porsche-driving ex-Scotland Yard chief, nicknamed ‘Captain Beaujolais’ because of his love of fine wines, has made a fortune in the private sector since stepping down in 2005. 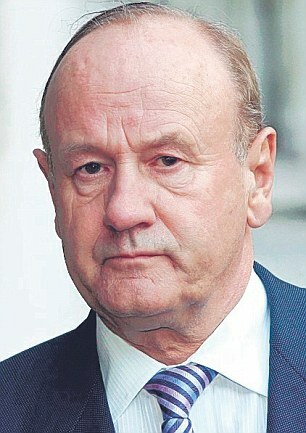 He was paid £1,000 a day for taking charge of the inquiry into the death of Diana, Princess of Wales. Now, he stands to make a healthy profit from the 18-month Libyan police course. The 104 officers have been trained in Huddersfield since before Christmas after the Home Office granted them student visas to enter the UK. The agreement was arranged by the Foreign Office (FCO), which has already faced criticism over its links with Gaddafi’s regime. Libyan dissidents living in Britain claimed there were 2,500 Libyan policemen in the UK and that some had been spying on meetings held by dissidents while carrying out their studies and have reported back to the Tripoli regime. 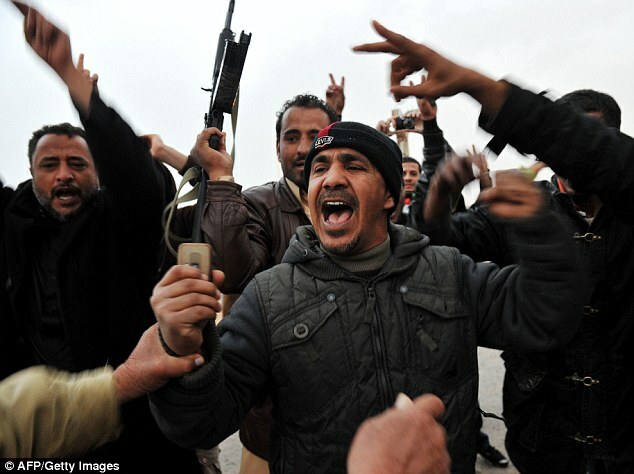 The police belong to what the Libyan leader calls the ‘People’s Security Force’. Human rights groups say Gaddafi’s hard-line officers, many recruited from the Libyan military, have beaten or killed hundreds of their own people during the current uprising. Labour MP Robert Flello called on the Government to investigate the role of universities in the education of Libyan officials who might use their new skills to help in the repression of their own people. The new row follows revelations last week over a £1.5million donation from a foundation run by Gaddafi’s son Saif to the London School of Economics (LSE) in 2009. The LSE decided to help Gaddafi seek international acceptance before the Libyan uprising while accepting Saif’s money for a study centre, LSE Ideas. It has since emerged that the board of LSE Ideas includes four men who have served at the highest levels of the British intelligence community. Lord Stevens was unavailable for comment last night. 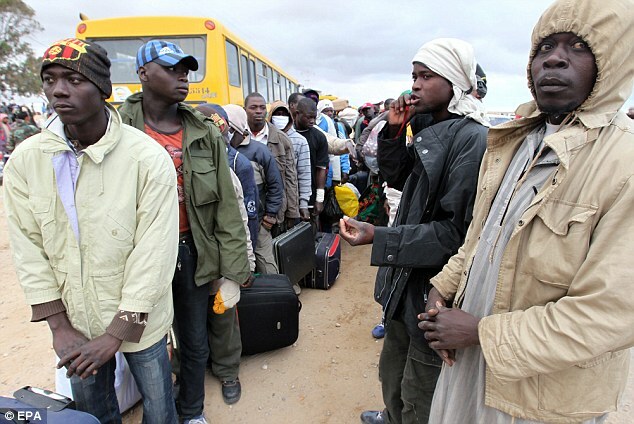 Not all expatriates who flee Libya do so because of Gaddafi’s tyranny. Some, mainly West Africans, cross the border into Tunisia bringing stories of terror at the hands of his opponents. Yesterday Nigerian Ifeanyi Okeke, 33, told how he was kidnapped at gunpoint, held captive for two days and beaten across his back with long sticks for refusing to fight for the ‘good guys’. Many Nigerians and Ghanaians have been targeted out of a fear that they are mercenaries hired by Gaddafi. But that was not the case with Mr Okeke and his friends, whose stories are supported by the International Red Cross. ‘The men who came for us with knives and guns knew we weren’t fighting for Gaddafi,’ said Mr Okeke, who is now at a transit camp near the Tunisian border. ‘They know us, we are labourers, we have families and we have lived in the same town for almost 10 years. ‘I was taken to their camp and they tied my wrists with tape. They kept saying, “You must fight with us, you are nothing, you must do as we say”. Several hundred Nigerians have fled Zuwara. Elsewhere at the border transit camp, which has mushroomed with the arrival of thousands of Bangladeshis, other Africans recounted ordeals like Mr Okeke’s, telling of terrifying bids to make them fight Gaddafi. and have been quick to bring home most of their citizens who make it to the border. Two of the Blairite cronies involved in the LSE Libyan funding scandal tried to use their influence to obtain a place for a relative of one of Tony Blair’s influential American allies, it was claimed last night. Former LSE director Lord Anthony Giddens and Professor David Held reportedly attempted to get the niece of Sidney Blumenthal, a former aide to Bill Clinton, into the university – even though she had sub-standard grades. The move was vetoed by then LSE lecturer Professor Erik Ringmar. 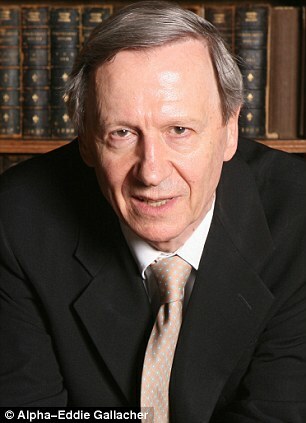 Lord Giddens was given a peerage by Mr Blair, and helped forge LSE links with Libya. Professor Held taught Colonel Gaddafi’s son Saif. A glamorous aide to a Tory Cabinet Minister who was flown to Tripoli and paid £10,000 to carry out research for Saif al-Islam Gaddafi is at the centre of claims that she was his ‘secret PhD ghost-writer’. Cambridge history graduate Flora Rose until recently worked for House of Lords leader Tom Strathclyde. Saif is being investigated by Lord Woolf, the former Lord Chief Justice, over allegations that there were more than 17 alleged instances of cheating in his doctorate for the London School of Economics where he was a student between 2003 and 2008. 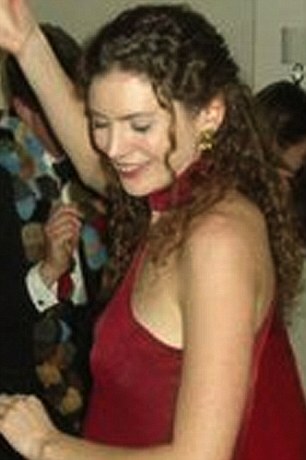 The Mail on Sunday has established that Ms Rose, 29, the great-grand-daughter of the 14th Earl of Dalhousie, travelled to Tripoli in March 2005 – the year Saif embarked on his 429-page PhD. She worked for Professor Omran Bukhres, who holds a powerful position within the Gaddafi court, and was told to produce research papers on academic subject areas. Previous Americans! STAND UP TO THE TEA PARTY BULLIES!